Paul and I used to have a falling out every time we went to the supermarket together, and it was always over shopping bags. Paul wanted the packers at New World to do their thing with fresh new plastic bags, and I was forever rustling around in the bottom of our pram for old bags to reuse. Paul complained the plastic bags weren't strong enough to be used over and over again (a fair argument since we did have a few bags break on us over the years). He also complained that it took too long to round them up, while looking apologetically over his shoulder at the people queueing behind us. I complained about the waste of non-renewable resources and the damage to the environment every time we got a new bag. Well, you'll be happy to know that grocery shopping became a lot more pleasant this year when I won a pack of five Envirosax reusable bags. These are, hands-down, the BEST reusable bags I've come across. Now Paul and I smile at each other in the grocery line. It's beautiful. 1. Strong and durable. 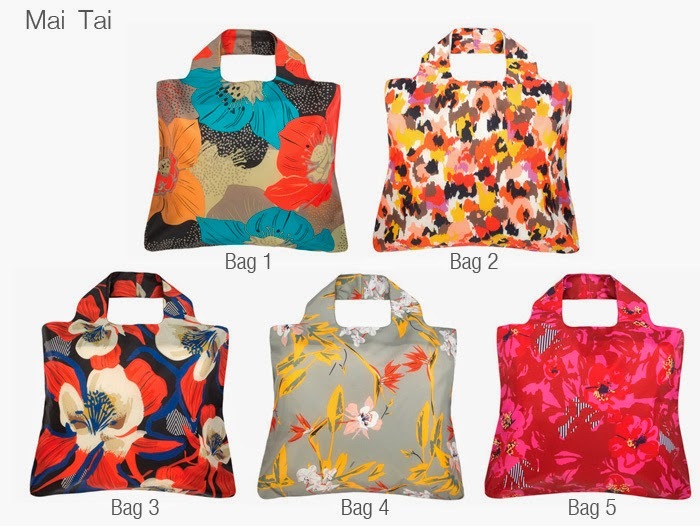 The bags are made out of polyester and have reinforced seams so they can carry a heavy load. (For example, on Wednesday I carried 6 x 2L of milk and 3 x 1L of cream in just two of these bags.) The handles are part of the bag (not stitched on) so they can't rip off like handles have done on some of my previous reusable bags. I regularly tie bags full of groceries to our pram, and they hold up well to that treatment. 2. Beautiful. There are heaps of different designs to choose from, so you can find ones to suit you. 3. Reuseable. They roll up small and snap closed so they're easy to store in a handbag. That means you're more likely to have them on hand when you need them. I won a set of five bags, which came in a handy little snap-lock pouch that now lives in my handbag at all times. 4. Waterproof and washable. I was especially grateful for these functions last week when I cracked a box of eggs on the walk home. The eggs didn't leak through the bag and after a spin in the washing machine, the bag looked as good as new. 6. Large. These bags pack down tiny so it's always a surprise to open them up and see how big they actually are. One Envirosax bag can carry the equivalent of two plastic supermarket bags worth of groceries. If you're a Kiwi and want to buy some Envirosax bags, head online to Toggle or look for the bags in cool stores like Commonsense Organics. What do you look for in a reusable bag? We have a massive collection of "green bags". If I forget to take them to the supermarket I usually buy a new one - but its ok, they find lots of uses around the home for storage etc. I give evil looks to ppl who have a trolley full of plastic bags, grrr. Personally I find it easier to carry the green bags to and from the car, or around town. You can fit more into them and the handles don't hurt your hands. I know some older people find it hard to carry a full green bag, but they just need to find smaller bags or ask that they are not over-filled. Anyway, love the bags, trying really hard to remember to take the everywhere with me, just in case (also handy at the farmers market). AND I got some mesh vege bags too - they are great, no more small bags cluttering up the kitchen either. I seriously need to get some mesh bags. I try to reuse the New World Vege bags, but often forget to bring them with me. And they have holes in them so they're not very useful for other purposes. Good point! I wonder if they could switch to boxes, or give you an option to purchase the in-store reusable ones. The Celine Bag plays a key role in enhancing a woman's appearance.